A core element of the SA Department of Agriculture’s success was providing advice to the farming community from a sound scientific base. This article traces the development of agriculture qualifications at Roseworthy College and the University of Adelaide, and the array of early Department of Agriculture staff that achieved these qualifications. In addition, the Department ran many “in house” on the job training programs to develop specialised staff skills. For many years, the Department of Agriculture was the SA government agency with the highest proportion of tertiary qualified staff. Until the foundation of Roseworthy College in 1884, there was no tertiary education body in Australia providing any sort of agricultural training. The first leaders of South Australia’s agricultural institutions all had qualifications acquired overseas. Custance was a graduate of the Royal Agricultural College, Cirencester, England; Lawrie had an M.A. and a B.Sc. from Edinburgh; Perkins was a graduate of L’Ecole d’Agriculture, Montpelier, France; Towar had an M.S. from Michigan State University; and Angus had a B.Sc. (Agriculture) from Aberdeen. Looking at the early specialist officers, we find that only G. S. Thompson, the first Dairy Instructor, seems to have a formal qualification. He is shown in a Public Service List as possessing the N.D.D. – probably the United Kingdom National Diploma in Dairying. The others, G. Quinn (Horticultural Instructor), D.F. Laurie (Poultry Expert) and P.H. Suter (Thompson’s successor), have left no record of any qualification other than experience. There is no reference to any professional qualifications for C. J. Valentine, the first Chief Inspector of Stock, or his successor, R.J. Needham. In later times one would have expected such a post to be filled by a qualified veterinarian. However, a history of Roseworthy College implies that J. Desmond, Government Veterinary Officer on the college staff in the early 1900’s was a Member of the Royal College of Veterinary Surgeons. In a different category were Albert Molineux and W.L. Summers who played important roles in the early days. Molineux was a journalist and publisher who was influential in creating awareness of the need for a better informed farming community and helped satisfy this need through the organisation of the Central Agriculture Bureau and its rapidly spreading local branches. W. L. Summers also started in the Central Bureau as Assistant Secretary but became Chief Inspector, charged in the 1890’s with the enforcement of acts of general application such as those concerned with chaff and hay, fertilizers, insecticides and fungicides. His duties were presumably deemed not to require technical expertise and his ability as a public administrator led on eventually to his appointment as head of the Minister of Agriculture Department. Roseworthy’s Diploma of Agriculture (RDA) was at first based on two years of study. This became three years in 1893, taking it beyond being merely a course for training farmers. In 1901, the University of Adelaide recognised its courses in Agriculture, Viticulture and Oenology as academically acceptable for the degree of Bachelor of Science in Agriculture. 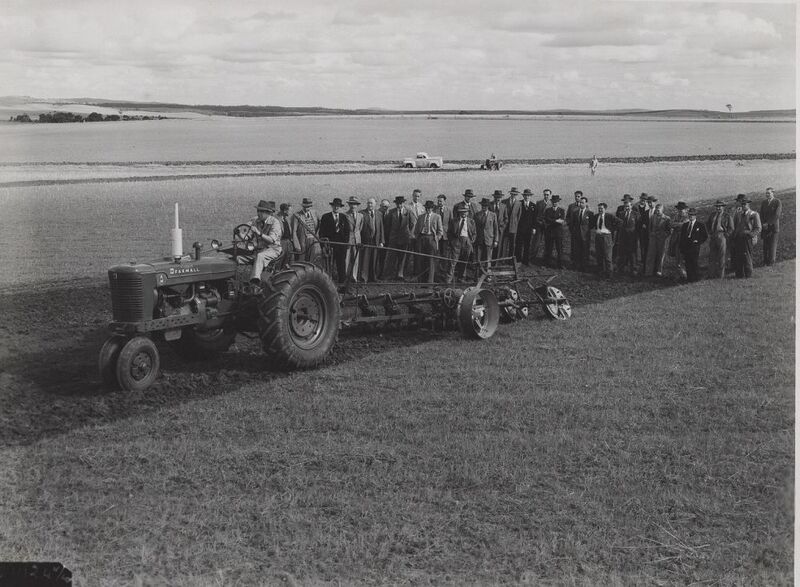 Thus the foundation was laid for Roseworthy College to train the staff who would become the backbone of the Department of Agriculture’s technical services. W.J. Colebatch, R.D.A. became Superintendent of Agriculture in the South East for the department in 1909-10. W.J. Spafford, R.D.A. became the first plant breeder at Roseworthy and R.C. Scott, R.D.A. succeeded him in 1914 when Spafford transferred to the Department of Agriculture. Each of these three men went on to senior leadership roles at the College or in the Department. A steady flow of R.D.A.’s (plus a few with equivalent qualifications from interstate agricultural colleges) provided the core of the Department of Agriculture’s expertise in experimental and advisory work until the 1950’s when the advent of increasing numbers of agricultural science graduates from the University of Adelaide (and elsewhere) started to change the balance. Pursuant to the requirements of the Agricultural Education Act, 1927, the University of Adelaide had established a four year degree course in Agricultural Science, based on the teaching resources of the university at North Terrace and the Waite Institute and of Roseworthy College. The first two graduates received their degrees in 1932. One of them, R.I. Herriot later became a senior officer of the department as the first Soil Conservator and then Chief of the Division of Extension Services and Deputy Director of Agriculture. From the second graduation of four students, H.K. (Harry) Kemp became the first Adelaide agricultural science graduate to join the department, as Horticultural Research Officer in 1934. He was later promoted to Senior Research Officer, to lead the strong research section of the Horticulture Branch from 1948. After World War 2, the University of Adelaide and Roseworthy College adopted a new structure for the B.Ag.Sc. degree course, involving tailored courses at Roseworthy in animal husbandry, agricultural economics, farm engineering and horticulture spread over second, third and fourth years. This replaced the original system where the Roseworthy teaching component took place in second year and essentially comprised the lectures and some of the practical work of the second and third years of the R.D.A. Course. The new course also offered more options in fourth year together with a project-based subject of the student’s choice. The demand for research and advisory staff trained in agronomy, soil science, entomology, plant pathology and biometry was well catered for within the options available through the upgraded four year University of Adelaide B.Ag.Sc. course. This course was, however, inadequate to provide the required level and spread of expertise for animal husbandry specialists and it had only a minor component of agricultural economics. By the early 1950’s, the University of New England at Armidale N.S.W. had developed two excellent new degree courses which were recognised as capable of filling these gaps. The Bachelor of Rural Science degree gave a major emphasis to animal husbandry within a general agricultural framework while the Bachelor of Rural Economics degree was specifically designed to give first rate training in farm management economics. Both these courses were added as options in the cadetship scheme which already also included veterinary scholarships. The first departmental cadetships had been offered in 1938-39 to R.G. Beck and P.J. Young. This concept of training and recruitment on the basis of a bonded scholarship and vacation employment in the Department was greatly enhanced in 1945 when there were nine cadets; four in soil conservation, two in horticulture and three in veterinary science. Veterinary graduates had the option of joining the Stock and Brand Branch or setting up in rural practice. Cadetships were used extensively through the 1950’s 1960’ and early 1970’s to recruit an array of suitably qualified scientific officers. Cadets completing a veterinary degree had the choice of joining the Department as a government veterinary officer or entering into a farm animal private practice in a country area in order to serve out their three year bond. At the time, rural veterinary practitioners were rarities and the government was keen to see their numbers increase to provide individual animal health services for a fee to livestock owners, allowing the Departmental veterinary staff to concentrate on flock and herd problems.